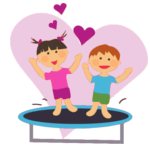 Pacific West Gymnastics will be hosting an exciting Valentine’s Day Party on Saturday, February 10, from 5pm to 11pm! 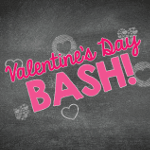 We will be offering a variety of activities for your child to enjoy in a safe, supervised and fun environment! Each enrolled student can grab a bundle of 32 valentine’s day cards to distribute to their classmates. Each card invites the friend to attend a free class and receive a free gift, by 3/31. Cards are available for pick-up at both locations. 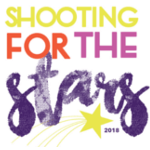 Mark your calendars & notify your friends and family – our annual Shooting for the Stars Performance is coming up! We are very proud of your child’s hard work & accomplishments and can’t wait to see them showcase their talents. Our camps are fun filled with high energy and structured activities, including–gymnastics, arts and crafts, group games and more! 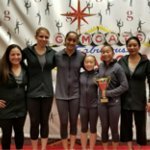 We often announce competition results, special events and news on our website and social media. Links are below. 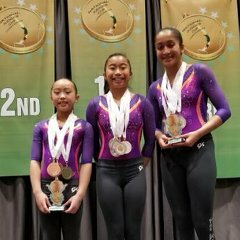 Pictured – Kaylei, Lauren and Charvi at the National Judges Cup.